Successfully Added Danmini 720P Video Doorbell - Night Vision, 1/4 Inch CMOS, 160 Degree Lens, PIR, 3.5 Inch Display (Black) to your Shopping Cart. The Danmini Digital Peephole Viewer is a smart security doorbell that efficiently allows you to check on who’s in front of your door without you needing to be physically there. Thanks to its sleek design, it can be easily placed in the vast majority of peepholes. Once in place, its 1/4-Inch CMOS camera provides you with stunning HD images of anybody that’s ringing your bell on the included display – ensuring that your doors will never again be opened for strangers or unwanted visitors. This digital doorbell provides you with the ultimate way to increase the security of your property’s entrance. Featuring a PIR motion sensor, it will automatically inform you whenever there is somebody moving around in front of your entrance. Coming with a high-end 720p camera, this video doorbell is capable of snapping HD pictures and video of your guests. Thanks to this, you’ll even be able to record and watch back who has been at your door while you were away from home. Packing four IR LEDs that are automatically activated when in low light, this security door bell provides you with clear images at both day and night. 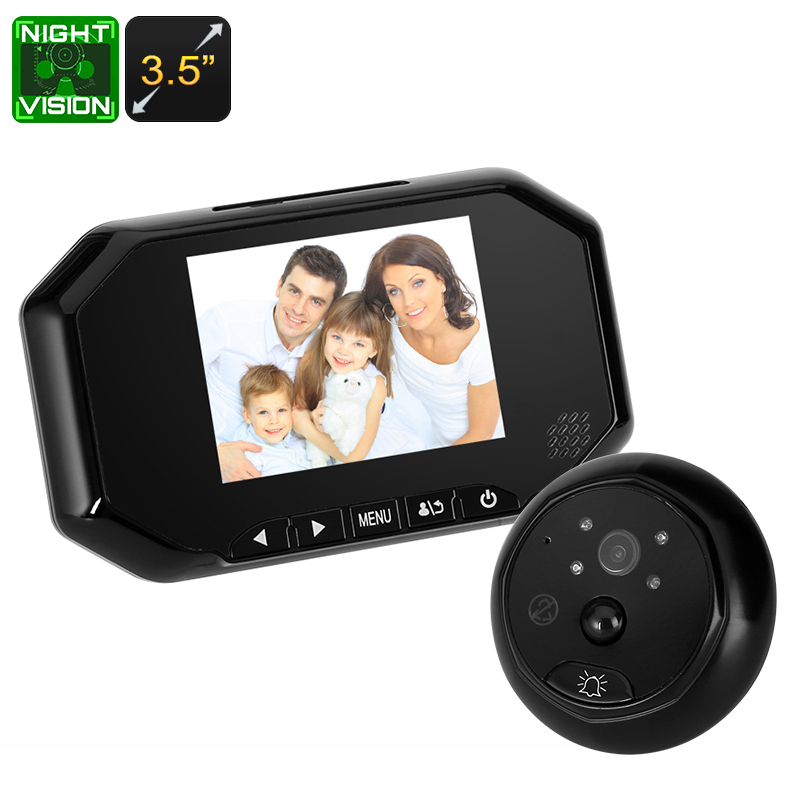 Supporting up to 5 meter’s of night vision, you can be assured that no matter the time of the day – you’ll always be able to see who’s in front of your door in HD resolution at the included 3.5-Inch LCD display. Additionally, the camera supports a 160-degree viewing angle – guaranteeing that you’ll get a clear overview of all that’s happening in front of your entrance. Other features such as the ''do not disturb'' and ''not at home'' functions will increase your overall experience even further. From now on you’ll never have to open the door for unwanted visitors and a video log will be kept whenever you are not at home – allowing you to watch and see whether you missed any important visitors. This video doorbell comes with a 12 months warranty, brought to you by the leader in electronic devices as well as wholesale electronic gadgets..